Russian GPS-Alternative Satellites Went ‘Illegal/Failure’: Solar Storm Damage or Cyberwar in Space? Between 1030 and 0400 UTC last night or early morning, most of Russia’s GLONASS satellites reported “illegal” or “failure” status. As of this post, they do not appear to be back online. GLONASS is the equivalent of GPS, an alternative global navigation satellite system (GNSS) launched and operated by Russian Aerospace Defense Forces (RADF). Apart from GPS, it is the only other GNSS with global capability. It’s possible that the outage is related to either a new M-class solar storm — the start of which was reported about 48 hours ago — or recent X-class solar flare on March 29 at approximately 1700 UTC. The latter event caused a short-term radio blackout aboutone hour after the flare erupted. But there is conjecture that GLONASS’ outage is human in origin and possibly deliberate. The absence of any reported outage news regarding GPS and other active satellite systems suggests this is quite possible, given the unlikelihood that technology used in GLONASS differs dramatically from that used in other satellite systems. 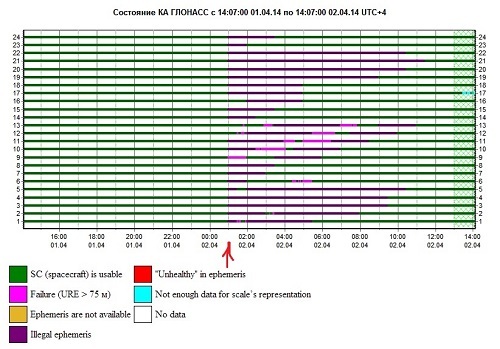 At least one observer mentioned that a monitoring system tripped at 21:00 UTC — 00:00 GLONASS system time. The odds of a natural event like a solar storm tripping at exactly top of the hour are ridiculously slim, especially since radiation ejected from the new M-class storm may not reach its peak effect on earth for another 24-48 hours. It’s not clear whether the new GLONASS-M satellite launched March 24th may factor into this situation. There are no English language reports indicating the new satellite was anything but successful upon its release, making it unlikely its integration into the GLONASS network caused today’s outage. — deliberate tampering in space, either through scripts sent from earth, or technology installed with inherent flaws. The last is most likely, and of either scripts sent from earth or the flawed technology scenarios, the former is more likely to cause a widespread outage. However, if many or all the core operating systems on board the GLONASS satellites had been updated within the last four years – after the discovery of Stuxnet in the wild – it’s not impossible that both hardware and software were compromised with an infection. Nor is it impossible that the same infection was triggered into aggressive action from earth. Which begs the question: are we in the middle of a cyberwar in space? Next(v-e-r-y- i-n-t-e-r-e-s-t-i-n-g what this is leading to?) Alien craft or military spy plane?